Celebrating its 34th year in 2018, the International Luxury Coach and Transportation Show is the biggest convention in the world for the luxury charter transportation industry. Set in Las Vegas, it is the ultimate destination for operators around the globe seeking education, product showcases and peer-to-peer networking. New Messina Armrests New armrests feature a coach-style design to accentuate your executive seats by FMS and Freedman Seating. The matching Messina armrest is perfect for in between seats or against the vehicle wall. Both armrests are available in wood grain, carbon fiber, and solid black or gray. See more here. Trieste 3PT Experience the utmost in luxury, comfort, and style. The Trieste seat is available with several different insert styles and upholstery materials, allowing you to customize the look that best fits your needs. See more here. 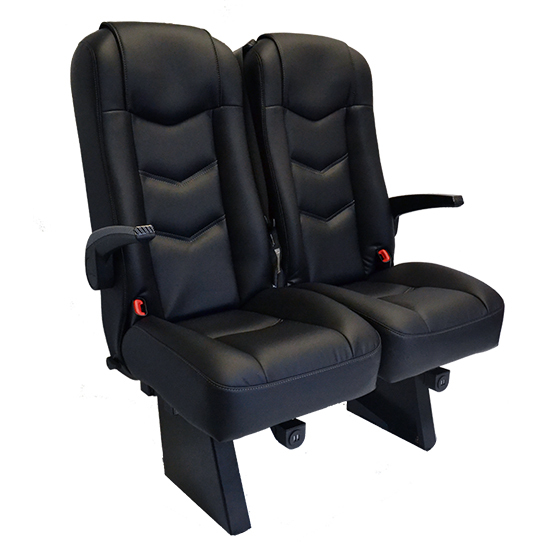 Bellagio 3PT Designed to fit the needs of the executive shuttle market, the Bellagio is available with both rigid and reclining backs, in a variety of seat widths and insert panel styles. Deep bolsters hug you into the seat, providing the ultimate in passenger comfort. Let all customers experience the look and feel of first class with the Bellagio. See more here. Venezia 3PT The newest edition to the popular Eleganza Collection, the Venezia seat comfortable, stylish and safe! See more here. Palermo 3PT The Palermo seat serves your economical needs without compromising style or comfort. The executive line by FMS includes the market’s most complete seating solutions with luxury and safety at the forefront of its design and engineering. See more here. Napoli Experience the latest in executive seating by FMS. Available in both rigid and reclining backrests, the Napoli comes standard with adjustable headrests, Eleganza leatherette vinyls, and optional contrasting style lines. Sporty, stylish, and luxurious, The Napoli provides maximum comfort to all passengers. See more here. The exhibit hall will be the epicenter of energy, fresh ideas, new and pre-owned products and and all-around great place to hang out. With exclusives no one else offers like happy hours and the all new Motorcoach Pavilion, you'll find it hard to get it all done in one day.